The humidor inside Hotel Habana Libre's Casa del Habano. The shop worker at the Hotel Nacional bent over a large cardboard box, counting six boxes of Cohiba Lanceros, a stack of Partagás Salomones in 10-count boxes and half a dozen boxes of Quai D’Orsay 54 cigars. It was the first time in two days of visiting shops that I had seen any of those cigars, and they were not being unpacked. The worker said they had been sold to a single client who bought them all that morning. The cigars had never even seen time on the shelves. The good news is that most shops have good inventories this week for the Festival del Habanos. I saw shelves filled with every major brand—except Cohiba—but not every size in those brands. The most notable shortages were in large cigars, especially Double Corona sizes. 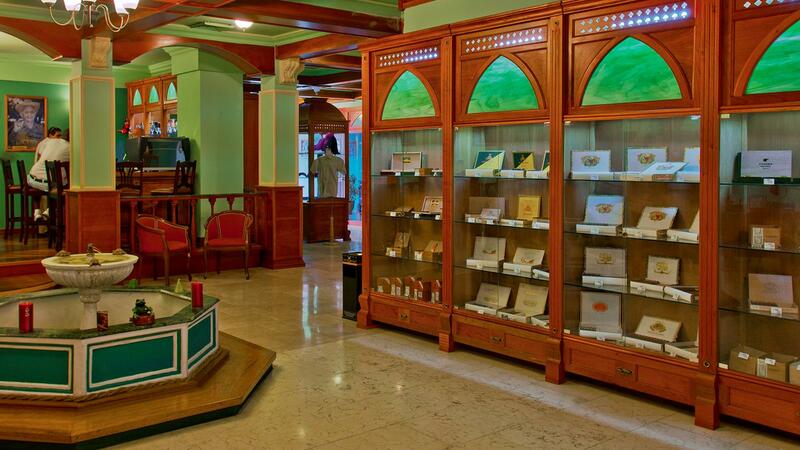 I did see about five cabinets of 50 each of Hoyo de Monterrey and Partagás Lusitanias at the Casa del Habano at the Habana Libre (which tends to have better supplies than most shops here), and most shops had a few boxes of Ramon Allones Gigantes and even some H. Upmann Sir Winstons, which have been hard to find lately. As far as Cohiba, where the brand was available, the selection included mostly smaller sizes, from Exquisitos and the lower number Siglo series. I did not see one box of Siglo VI, and only a few boxes of Siglo Vs, and other than some already sold boxes, no Esplendidos. The only Behikes I saw were BHK 56s in an open box for single sales at the Habana Libre, priced at 31.80 CUCs. One bit of good news is that prices have not been raised, and no seems to be expecting one in the near future. And, as always, the prices are uniform across all the cigar shops in the city. One shop manager told me that because of the shortages in the bigger sizes, she was trying to convince people to buy smaller cigars, such as a Romeo y Julieta Petit Royales, a petit corona size. “Connoisseurs like to buy the smaller cigars, but people who don’t really know tobacco that well, they don’t get it,” said Elena Perez, of the Casa del Habano at Habana Libre. All the shop managers commented about the dramatic falloff in American tourists since President Trump’s announcement in June 2017 re-imposing stricter regulations on travel by Americans to Cuba. Several of the shop owners said they had noticed a slight uptick in Americans again just in the last couple of weeks, especially cigar lovers. “The Americans who know tobacco don’t really care about price. They just want good cigars. And, they buy in quantity,” said a shop worker at the Nacional. Most of the box dates on cigars being sold today are predominantly from mid-2017 to December 2017. My estimate is that over half the boxes I checked were from November and December 2017. With the exception of a few boxes in the Añejado series, I can count on one hand the boxes I checked with box dates prior to 2016. Unfortunately, given the number of cigar lovers in Havana this week, my report on inventories and on specific cigars won’t be very meaningful. By the end of the week, most shops will need new shipments to restock their shelves.